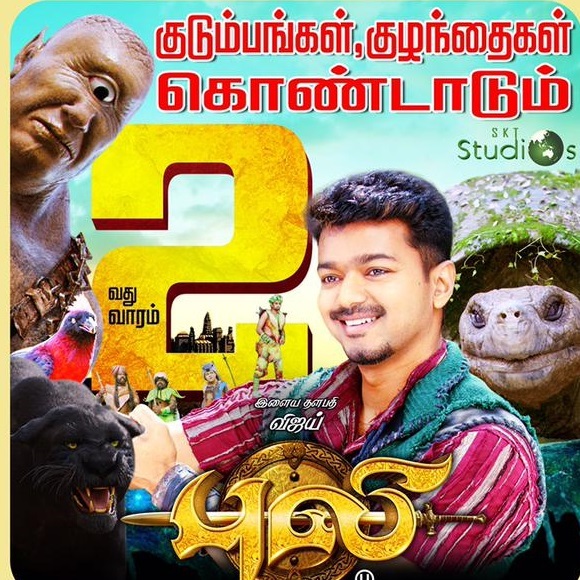 Puli, one of the most expected movies of 2015, witnessed a grand release in Malaysia. Despite the mixed reviews the movie opened well with MYR 2,995,203 [$698,500] in just 4 days. This is the 6th best opening for a Tamil Movie in Malaysia. In its 2nd weekend the movie collected another MYR 564,973 [$136,599]. The total now stands at MYR 4,450,609 [$1,076,066 ],17th highest grosser behind Yennai Arindhaal and Vettaikaran. The movie is expected to close as Below Average as the selling price was high. It's also worth mentioning that Puli's actor Vijay's 5th movie to join the prestigious $1 Million club in Malaysia.